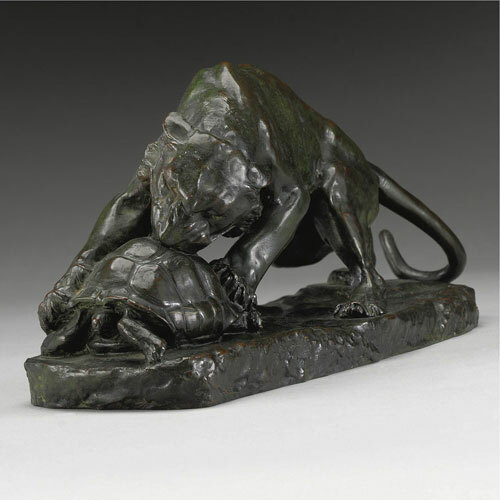 Georges Gardet (October 11, 1863–1939) was a French sculptor and animalier. The son of a sculptor, Gardet attended the École des Beaux-Arts in the atelier of Aimé Millet and Emmanuel Fremiet (another noted animalier). Gardet’s wife Madeleine was the sister of painter and decorator Jean Francis Auburtin, who collaborated with Gardet on work for the Parisian Exposition Universelle (1900). Gardet was made an Officer of the Legion of Honor in 1900, and was a member of the Académie des Beaux-Arts, and the Society of French Artists.